Saddhaloka was born David Luce in Jersey in 1948. he left the island to continue his education at Leeds University, where he obtained a BA in History and developed a strong interest in Eastern religious, especially Buddhism. After completing his degree he married and traveled overland to India, where he spent fourteen months visiting several of the holy places associated with he Buddha. After returning to Britain he decided it was time to get ‘down to earth’ and spent the next five years working on farms, mostly as a herdsman. This included three years in Ireland in a village community with people with learning difficulties. He maintained a strong interest in meditation and Buddhism, and in 1979 moved with his family to Norwich, where there were other Buddhists with young children. He was ordained within the Western Buddhist Order two years later and given the name Saddhaloka, which means ‘light of faith’. He spent the next thirteen years working for the Norwich Buddhist Centre. As well as teaching meditation and Buddhism, he led courses in massage and communication skills. In 1995 he moved to Padmaloka, a retreat centre in Norfolk, where he helps men to prepare for ordination. He also has a special interest in developing Buddhist activities in Finland, Estonia, and Russia. Saddhaloka now has three grown-up children and a grand-daughter. When I was a Teenager, an uncle came to live with us in Jersey. He had spent much of his life in Burma and had expected to die there, but a new nationalist government had forced him to leave. When I started to develop an interest in Eastern religions, he gave me a book from his extensive library. 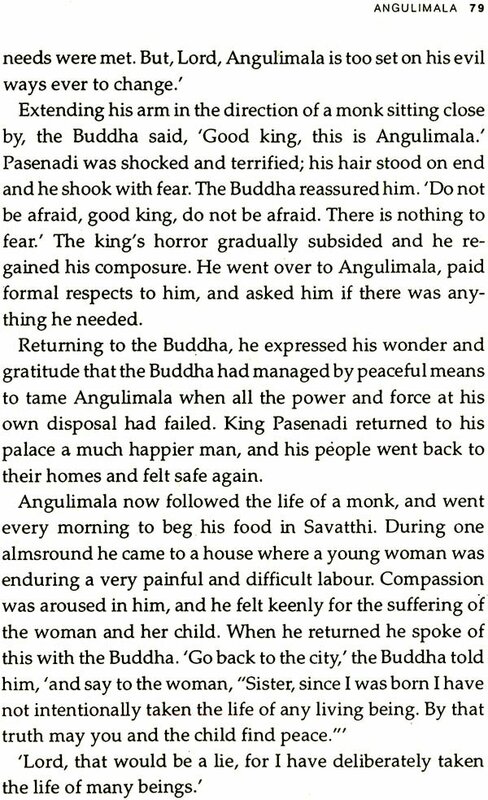 It was The Life of the Buddha, a collection of stories and teachings from the Pali Canon, compiled by the English Buddhist monsk, Nanamoli. For ten years the book remained largely unopened. Then, a few months after I became seriously involved in Buddhism, I went on my first solitary retreat and decided to take it with me. During the two weeks of that retreat, the Buddha and the world of ancient India came vividly alive for me as never before. I gained a sense of the Buddha as a real human being, who ate and slept, and got sick and grew old as we all do, while communicating something quite extraordinary, not just in what he said, but also in such simple things as how he walked and ate and looked at people. In his disciple I recognized the same hopes and fears, struggles and disappointment, pettiness and great-heartedness, the same contradictions, that are to be found in his followers today. I have returned to The Life of the Buddha again and again, for in this book I found a doorway into the great treasury of the Pali Canon through which I could begin to explore the many volumes available in translation. Previously, these tomes had seemed rather daunting and inaccessible, but now their great store of riches had been opened up to me. The Buddha lived in northern India tow-and-a-half thousand years ago. After his Enlightenment, at the age of thirty-five, he spent the remaining forty-five years of his life wandering the roads and by-ways of the ‘middle country’, the area of northern India then dominated by the rival kingdoms of Magadha and Kosala. He taught anyone who was prepared to listen; kings and beggars, philosophers and farmers, housewives and courtesans, murderers and holy men. All these were among his disciples. The accounts of the Buddha’s many meetings, along with summaries of his teachings, were memorized and recited by his monk disciples at their regular gatherings, and in this way they were passed down through the centuries. There were once many different collections of these stories and teachings, gathered together by various schools of the developing Buddhist tradition. As far as we know, only one complete collection has survived to the present day. It was written down in Sri Lanka about 500 years after the Buddha’s death, and is known as the Pali Canon. 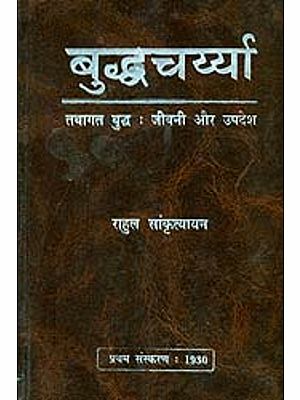 This collection is now available in English in a number of translations, and details of some of these are given at the end of this book. It is mostly from my reading within these translations over the past twenty years that this selection of stories is made. (There is very little about the early life of the Buddha-to-be in the Pali Canon, so in my account of his early years I have also drawn on a much later and more poetic text called the Lalitavistara.) There are many, many stories about the Buddha, and I have chosen those that have spoken to me and that in one way or another have moved me, whether to tears, to laughter, or to quiet reflection. Some of the stories encapsulate beautifully profound teachings of the Buddha, and provide a very good basis for study and contemplation. I have also included stories that capture different qualities of the Buddha: his wisdom, his reason and clarity, his mysteriousness, his practicality, his remarkable powers, his gentle humour, his courage and fearlessness, and, above all, his kindness and compassion. I have retold the stories, rather than just collate different translations, because even in the best translations the idioms and Buddhist terms of the oral tradition can be a bit of an obstacle to the newcomer, and I wanted to make these stories accessible to as many people as possible. At the same time I have tried not to take advantage of my story-teller’s licence and to be as true as possible to the mood and spirit of the original. For example, there was a beautiful formality in the way in which people addressed each other in ancient India, and I wanted to retain something of this rather than substitute an informality more suited to a modern idiom. In reading these stories, we need to remember that those who originally recited them and listened to them did not live in the same sort of world as we do, and did not think as we do. 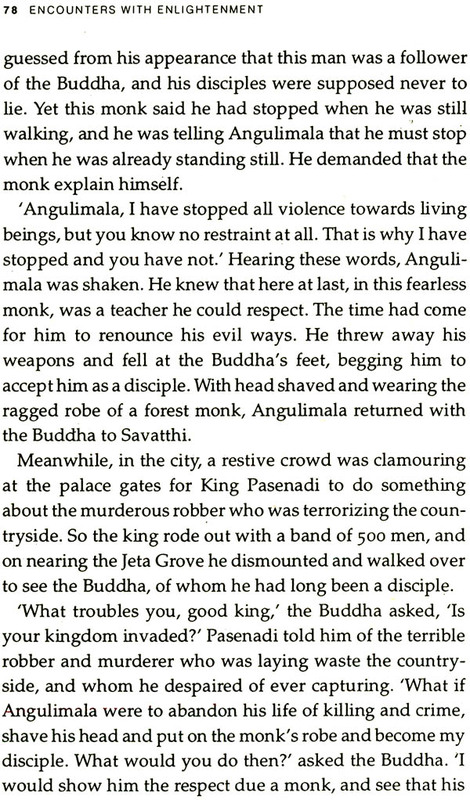 Accounts of the Buddha’s meetings with farmers and wandering holy men alternate quite naturally with tales of his meetings with gods (and there were many kinds of gods), yakshas (sometimes translated ‘goblins’ or ‘fairies’), and maras (evil ones). I simply recount the stories of the Buddha’s encounters with these strange and marvelous beings as they have been passed down, and leave it to you to arrive at your own interpretation. At the end of each story is a verse from the Dhammapada, one of the oldest sections of the Pali Canon. Scholars have concluded that the collection of pithy and profound teachings that make up this scripture were ‘set’ in this form very early on. They therefore bring us very close to hearing the authentic voice of the Buddha. I have left these verses in the words of the translator, and added a few endnotes to elaborate on some terms with which the reader might not be familiar. This book is not intended simply to be read from cover to cover, but as something to dip into again and again. My hope is that through these stories and the verse from the Dhammapada, the Buddha will begin to come alive for you as you travel with him in your imagination along the dusty roads of ancient India. More than that, I hope the book will encourage many people to go on to explore for themselves the great treasury of the Pali Canon, and discover within it the same inspiration and guidance that I am so grateful to have found there. Every now and then we meet someone who can change the course of our life. In his time the Buddha influenced dramatically the lives of many men and women that he met, from beggars to kings, murderers to holy men. There are many stories about the Buddha in the Buddhist tradition, some encapsulate profound teachings. Others illustrate the qualities of this truly remarkable figure – his clarity, his courage, his gentle humour, his kindness, and more. Here Saddhaloka retells in a simple and straightforward way the stories that have moved him most. Travelling with him along the dusty roads of ancient India, we meet the Buddha again and again. If we are able to grasp this precious opportunity, the Buddha’s timeless wisdom and inspiring example will change us too.